Simplify Complex Call Flows Like Never Before. Our ACD solution can be ready to roll with minimal configuration, right out of the box. Experience seamless call control and save time and money by fast-tracking your go-live. Route2Cloud’s ACD system is the backbone of any inbound or blended call center. What does ACD mean? Automatic Call Distribution (ACD) systems can simultaneously distribute multiple calls to the appropriate agent or location, where each call is instantly routed to its destination based on predetermined logic. Our comprehensive Automatic Call Distribution software allows you to choose call routing paths based on agent skill, language, ranking, and more. The Route2Cloud ACD system is the perfect solution for both low and high-volume contact centers. If you have more inbound phone calls than you do agents, our ACD will easily manage your call flows, eliminating busy signals and providing your customers with timely, appropriate service that best suits their needs. Inbound phone calls arrive at any of our several carrier-grade, Tier-1 facilities and instantly pass through the intelligence layer of our cloud based call center platform. Our system’s intelligence layer then applies all the configuration and preferences you’ve already decided upon in our user-friendly administrative interface, and immediately dispatches each call to the most suitable agent. We offer the convenience of connections made via standard landlines, SIP devices, and our WebRTC-based integrated softphone. Provide tailored customer experiences with features like whisper messaging, which can signal to the agent what type of call they’ll be receiving next. Useful CTI (Computer Telephony Integration) screen pops instantly display relevant scripting and caller information, allowing agents to further personalize each customer’s experience. 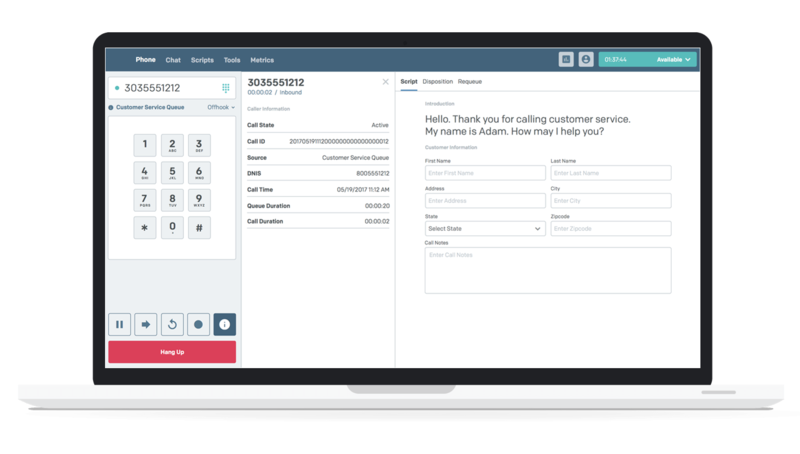 Easily manage your contact center’s call flow with features like queue prioritization, agent blending capabilities, and our proprietary QueueFlow routing engine. Route calls in queue to agents based on rank and/or skills to ensure relevant, effective interactions for every customer. Cut out agent desktop distractions and clutter with a full-service solution that integrates all your information into one seamless interface. Our ACD automatically routes calls to the most qualified agent available and displays vital customer information, enhancing their experience and increasing agent productivity. Make geography irrelevant with a call distributor that reaches agents far and wide. Easily manage a team with members on every end of the continent, coaching and directing them from afar with features like agent chat, whispering, and call barge-in. And you can monitor it all while on the road from any mobile device. Route2Cloud’s dynamic porting system offers a convenient pricing model unlike any other in the industry. Most call center solutions force your company to buy limited bundles of lines to manage inbound call volume. Run low on lines and you have to contact your provider and purchase more, or risk losing important customer connections. At Connect First, we never want to put our customers in a tight spot. Our ACD system was designed to offer unlimited dynamic porting, which means you’ll never run the risk of missing calls, you’ll never have to call us to ask for more lines, and we’ll never charge you extra for the lines you do use. Our automated call distribution system is easy to learn and easy to use. We’ve automated the most basic and commonly used call flow functions, leaving you free to explore our wide variety of more granular customized configuration options. Get as complex and creative as you please with your call center’s inbound call flow setup, or keep it short and simple — either way, our intuitive system makes it easy to arrange a flow that works for you. Our settings are named and grouped logically and intuitively, with helpful pop-up tooltips that further explain functionalities. In just minutes — without a coding experience — you can create a queue with conditional events, agent skills, specific schedules, and more. We offer a range of special condition handling settings to ensure you have an option for any and every situation that might occur in your inbound call center. Our ACD includes granular scheduling features and options to specify call flow actions for less likely but possible events, like how to proceed when no agents are logged in to the system. What happens when a call queue reaches maximum capacity? You decide. Play a ‘Please Call Us Back’ message, take a voicemail, offer a queued callback option, transfer the call to an IVR, or even transfer it to another call center via an external dialed number or through our integrated cloud routing software. Use our Special and Velocity ANI features to keep track of and effectively manage special and frequent callers. Route2Cloud’s Comprehensive ACD. Built To Simplify the Complex. Over the decade-plus we’ve been in the cloud call center software business, we’ve learned to evolve alongside our customers’ needs. We’ve learned how to streamline our interface and features to provide you with the robust, user-friendly functionalities you’ve come to know and trust. Our ACD solution follows that tradition with a setting for just about everything, while still remaining simple, flexible, and configurable, allowing you to make your call flow routing as straightforward or intricate as you need.